On the 9th of September 2016 Don Bosco Network Board met in Krakow to discuss current work progress and preparation for DBN General Assembly meeting which is planned on the 24th-26th October 2016 in Rome. Meeting was hosted by SWM in Krakow. 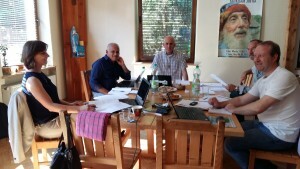 Fr Guillermo Basanes – Counsillor for the Missions, Fr George Menamparampil – SDB Mission department, Joanna Stozek – DBN President, Peter Annegarn – DBN Vice President and Wojciech Mroczek – DBN Coordinator attended the meeting.